It has been a real winter. 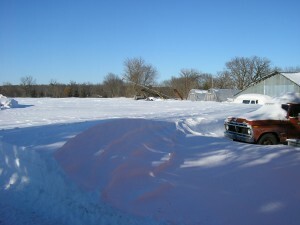 It feels like I spent most of January plowing snow. We could get another foot of snow this month, but it feels like it is over. The sun is coming back north. The birds are singing. A wasp thawed out and was staggering around on the window sill this morning. I have moved enough snow that I can get into the greenhouse again. It didn’t help that the doors were iced shut, but with the warm weather the past few days it is all good. Today I’ll start heating up the floor to get ready for starting onions and herbs. I’m also going to test the germination of the seeds that we saved from last year. Meeting season is over and it is time to wake up the next farming season. At the Northern Plains Sustainable Ag Society meeting I came up with a vague idea of a farm breeding club to produce locally adapted vegetable seed. We would select varieties to do well in our region and produce the seeds. At first it will probably just be a club or coop where we share the seeds between the farms that are growing them. In the future I see it being a local seed company, a place with a catalog of seeds for local growers and home scale vegetable gardeners. If you have a vegetable garden and are interested in participating in a beta test I have some vegetable seeds that were in 2012 and grown out in 2013. I know that these produce good fruit. I also have some seeds that were saved from 2013 that have not been grown out. I’m very confident that they will also be productive since I’m planning to use a lot of them this year. Send me a note and I’ll send you my seed list. Packets will $3 each plus $1 for envelopes and postage. Most of the varieties are straight ahead Open Pollinated varieties, but some are seeds saved from hybrids. F2 seeds are saved from hybrids so they produce a lot of variation. All of the F2s that we grew out last year produced useable veggies, but the size, shape, and color were all over the place. Some of those variations will become new varieties. F3s are the result of selecting the plants and fruit with the best characteristics of the F2s from last year. They will be less wild, but will still have a fair amount of variation. I will have organic vegetable transplants available for sale this spring. There will be all manner of tomatoes ranging from big reds to cherries to heirlooms and paste (roma type). In addition to bell peppers there will be red and yellow sweet peppers, and many hot peppers. Eggplants, onions, herbs, and a few flowers will round out the mix. The plants will be available at the Birchwood around Mother’s Day, at the Saturday Delano Farmers Market, and here at the farm. Our Sustainable Farming Chapter has been pushing around the idea of doing something with locally produced food, beyond fresh produce. Catsup, pickles, and who knows what else ( pop and potato chips would be popular, but were ruled out early on). Last fall Carl over at Three Crows tried making a test batch of kimchi using all local ingredients (except for salt) to see what the process would be like. He used cabbage, onions, the real deal Korean kimchi peppers, daikon, and smoked hot peppers (in place of fish sauce) all from our farm. It is spicy, but not too hot. Now I have jars of local kimchi available for sale. Pints are $9, Quarts are $16 and Half Gallons are $30. If you are interested, let me know. Mary is addicted to it. A couple things coming right up on GMOs. The USDA is getting ready to approve a new generation of RoundUp ready seeds that will be resistant to Dicamba and 2,4-D. The first generation of GMO crops was a failure due to the creation of RoundUp Ready resistant weeds. So now they want to add much more toxic and likely to drift chemicals to the mix to fix that problem. It didn’t work the first time, so why not do it again ?! Seems crazy to me. One of the big problems with Dicamba and 2,4-D is that they drift a lot more than RoundUp and they can drift for miles days after they have been applied. The drift will affect everyone not growing GMO corn or soybeans. The other problem is that they are much more toxic chemicals. Today is the day to act. The USDA comment period closes tomorrow. Search for ‘USDA Subject: Docket No. APHIS-2013-0042 ‘ and make a comment opposing the approval for these crops. Closer to home Right to Know Minnesota is having a lobby day at the Capitol in St. Paul to push for the labeling of GMOs in our food. Unless you are eating an all organic diet you are taking part in a mass feeding study to see if novel proteins in our food have undesired health effects. If you would like a chance to opt out of this poorly designed experiment, labeling GMOs in food is a good first step. Big Ag and Big Food are spending 10s of millions of dollars to keep food from being labeled when close to 90% of Americans think it is a good idea. It seems important to them to keep us from knowing what we are eating. I get the idea that these corporations are all excited about the free market doing its work, not to mention I don’t trust them to do what is the best for me. The event at the Capitol will be Thursday, but they are asking that you sign up in advance so they have time to set up meetings with your legislators. See their website at http://righttoknowmn.org/.